The New England Patriots bring in another win at this year’s Super Bowl. 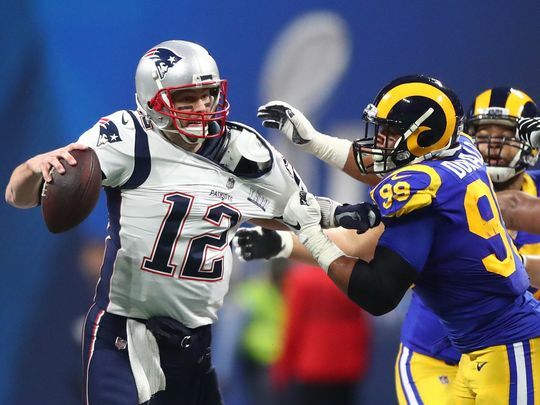 This past Sunday, the New England Patriots and the Los Angeles Rams faced off in Super Bowl LIII. This marked New England’s ninth Super Bowl under the coach-quarterback duo of Bill Belichick and Tom Brady, which is more Super Bowls than any other pair in league history have had. The Patriots have been a force in the NFL since the early 2000s. As broadcaster Scott Zolak said after the Patriots defeated the Chiefs two weeks earlier to earn their spot in the Super Bowl, “America’s worst nightmare is back.” Winning this Super Bowl would tie New England with the Pittsburgh Steelers at six wins, the most in franchise history. For the Rams, this would have been their first Super Bowl win since moving back to Los Angeles from St. Louis in 2016 and for their starting quarterback, 24-year-old Jared Goff. Football fans saw a heavily defensive game with a final score of 13-3 New England, making it the lowest scoring Super Bowl of all time. The low score was met with mixed reactions by fans, some finding it boring while others finding the defense-heavy match just as exciting and nuanced as usual. This past NFL season was characterized by robust and effective offense. The average number of points that a team scored in a game this season was 23.3 — the third highest in league history. The pace of the Super Bowl came as a surprise to many, especially since both the AFC and NFC championship games ended in fireworks and overtime. Aside from New England’s record-breaking performance and the debate about the entertainment value of the game, how much does the Smith community care about the Super Bowl? In short — not much. Last week I surveyed 45 Smith students to gauge their general thoughts and interest about the Super Bowl. About half of those surveyed (53.3 percent) said that they either didn’t watch the Super Bowl last year or don’t remember if they watched. As far as this year’s Super Bowl goes, only 20 percent said that they were planning on watching it while 37.8 percent said they might watch it; the largest chunk of students, 42.2 percent, said that they didn’t plan on watching it. In the survey, 54.5 percent said they didn’t care which team won, while 27.3 percent were rooting for the Patriots and 18.2 percent the Rams. The Patriots and Tom Brady may have picked up a monumental win for the franchise, but the game itself had questionable entertainment value, and a large portion of Smith students didn’t care to catch the game.